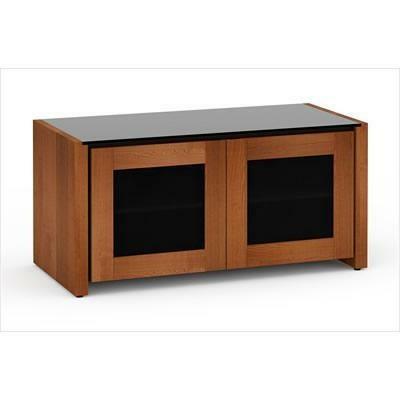 The easygoing and laidback style of Corsica from Salamander Designs is represented in a cherry finish with extra-thick end panels and complemented by a seamlessly integrated black glass top plus solid wood doors with smoked glass inserts. Cabinets are built on an all aluminum chassis and incorporate premium quality to ensure reliability and durability. Cabinets incorporate premium quality components including solid wood doors with soft-closing dampers, infinitely adjustable shelves, ventilation louvers in the bottoms of cabinet segments, and removable rear panels for fast, easy access to component jacks.